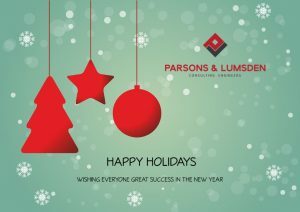 As the year begins to come to a close, Parsons & Lumsden would like to thank all our friends, family, clients, staff and colleagues for a very positive 2018. It has been a very pleasant year and we are really looking forward to what the new year will have in store for us. However, we trust that everyone will have a relaxing, well deserved, break. 14th December 2018 - 7th January 2019. Error: Error validating access token: Session has expired on Saturday, 13-Apr-19 02:00:32 PDT. The current time is Thursday, 18-Apr-19 05:15:42 PDT.